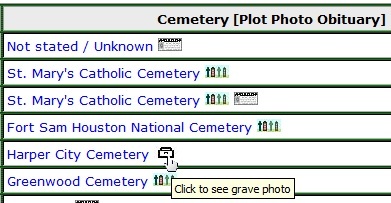 What do the icons mean in the Cemetery List? The names included in the Cemetery List may include various icons to indicate that additional information is available for that individual. Hover (i.e. place) the mouse over the icon. The information shown to the right is included at the bottom of every page in the Cemetery List.